Just like humans, dogs need to adjust gradually to the cold. They are used to being in the warmth of a heated home, and even with their furry coats, winter weather can be harmful and stressful on your pet. They are susceptible to frostbite and hypothermia, just the same as their human counterparts. Read more about winter safety tips for your dog and how to deal with two serious weather concerns: Frostbite and Hypothermia. Frostbite happens when the animal’s body gets cold, it begins to take the blood from the extremities to stay warm, shutting down the circulation. Ears, nose, tail, and paws are all at risk for frostbite. Look for skin discoloration pale or grey and possibly hardened skin. If you see frostbite happening, try to gradually warm-up your pet. Frostbite can be painful when bringing their circulation back, so bring them inside, don’t sit them in front of the fireplace right away. Hypothermia can happen when a dog spends too much time in the cold, gets wet in cold temperatures or when dogs with poor health or circulation are exposed to cold. Look for signs such as shivering, and cold ears and feet. Hypothermia affects mood and the lack of energy, such as depression, lethargy and weakness. As it gets worse, muscles will stiffen, heart and breathing rates slow down, and there’s no respond to stimuli. Hypothermia is life threatening as it progresses. So, protecting your dog from frostbite and hypothermia is essential. Learn how to recognize the signs that your dog needs to come indoors to warm up. 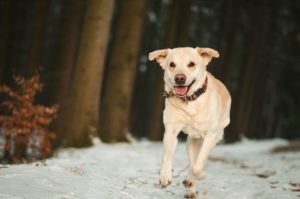 Some dog breeds are blessed with thick fur that keeps them warm naturally, even in very cold temperatures, but dogs with thin coats may need to wear a sweater or coat when out for winter walks. A good coat should reach from the neck to the base of the tail and also protect the belly. But remember that coats will not prevent frostbite on the ears, feet or tail … so even with a cozy coat, don’t keep your short haired dog out too long in freezing temperatures. Your family pet may love to spend time outdoors but in winter even the furriest dog can get cold. Ears, paws and tails are all susceptible to frostbite. Take your dog out frequently for walks, exercise and play … but when the temperature drops, don’t leave him outdoors for long periods of time. A good rule is to go out with him and when you’re ready to come in, he probably will be too. If he’s outside in your yard by himself, check often to make sure he’s not showing signs of feeling cold. Your dog needs a clean, well-groomed coat to keep her properly insulated. This is especially important if your dog spends a lot of time outdoors. After bathing, dry your dog thoroughly, especially before allowing her outside. Just as we tend to develop foot cracks in winter, dogs can also suffer from cracked pads. If your dog has furry feet, trim the hair that grows between her pads to prevent ice buildup between the pads. Winter salt on city sidewalks can also burn your dog’s pads and is toxic, so after walks around the neighborhood, rinse or wipe your dog’s paws to remove any salt – you don’t want her licking it off. If your dog shows signs of discomfort when walking outside on frozen or salted surfaces, consider using dog booties to protect her paws. Pets and Vacation: Where do you even begin?